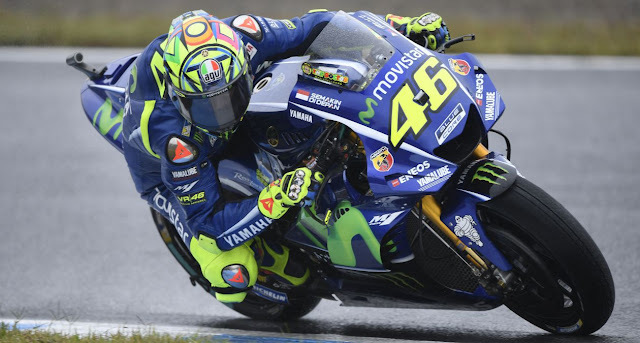 MOTEGI - He was delighted by Valentino Rossi this morning, stepping out of the twelfth to second place suddenly: "We had started well, greatly improving the trim with the extreme wet. I do not mean to be surprised but surely happy because the lap times were good. It's worth balancing and adjusting the rear setting. " Then, in the fourth and final free practice session, around the lunchtime, the track began to dry up, and his Yamaha crashed into a crisis: "We did not change anything, but in those conditions, we suffered a lot. When there is not enough water we always find it hard to find the right grip on the back. " So, at the curve 8, his M1 disarmed him for the first time since he went back to running with his right leg still fractured. Luckily, the nine-time iridescent was able to get back to rest and saddle again: "Luckily the bike turned under me, " said the Doctor. " Now I have a bit more pain, but I did not hit much leg: just one finger, as always. But I did well because it was a bad fall. " The incident, in short, did not further aggravate his physical condition, but he nevertheless deprived him of the first motto: "The one with the best design, which would have been important to qualify, but unfortunately was too much to do: much commitment at all". At that point, with a motorcycle that was not at all comfortable with the damp asphalt, Tavullia's phenomenon proved to be a joke, using only the dry tires at the start of official tests: "But it was still too wet and the track did not dry up fast enough because it was cold. So I had to go very flat, the temperature of the tires went down and I could not regain normal adherence. " Result: After all these series of misadventures, Vale found himself in the same position as yesterday afternoon, twelfth. "It will be hard to start back tomorrow, " says 46 - But for me, the most important thing will be the weather. If there is rainfall (as it seems from the forecasts, our pace is not so bad, with less water on the run no. " Yamaha at shrimp step did not go better to his teammate Maverick Vinales, slipping further back in the standings until qualifying for 14th: too far behind his world title contenders Marc Marquez and Andrea Dovizioso. "I've tried all of them, " Top Gun explains, " but in the wet, the problem is the same year-round: traction. With this bike I can do nothing more: I'm trying to win a title, but that's impossible. I feel that the championship comes out of my hands whenever I go down the track and find myself over a tenth place while my opponents are in the top positions ". The only Yamaha to save was last year, entrusted to the Tech 3 team and Johann Zarco's hands, who managed to put it in pole position: "He was very good - he takes off his hat Rossi - because he has mounted the supersoft tires were wet on the finish and made just one lap. He made the difference and we know that the bike is better with water. "